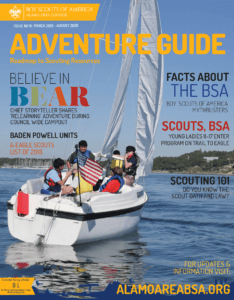 The River District of the Boy Scouts of America, Alamo Area Council (BSA) works with 546 volunteer adults to serve over 1340 youth in eight school districts within Comal and Guadalupe County. With the partnership of 24 charter organizations, River District provides character building values and outdoor adventure for boys and girls from 5-20 years of age. Reach the River District Leadership team at River@AlamoAreaBSA.org.